An artificial black hole has been simulated in a laboratory by scientists using lasers at St Andrews University. Intense light pulses were used to create an artificial event horizon - the defining feature of a black hole known as the "point of no return". The development may allow researchers to test Professor Stephen Hawking's theory that black holes radiate light. It is the first time that scientists have successfully simulated an event horizon using light. The experts behind the experiment described it as a "milestone". 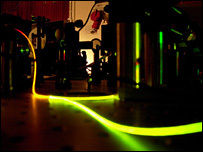 It involved firing laser light down an optical fibre - with different wavelengths of light moving at different speeds. This then created a distortion which causes a wave of light to be trapped - effectively a black hole event horizon which cannot be escaped. The fibre-optical black hole could allow physicists to investigate what happens to light at both sides of an event horizon. Professor Ulf Leonhardt, one of the physicists involved in the experiment, said: "Creating optical analogues (simulations) of the event horizon has been an exciting adventure with many ups and downs, high hopes and deep disappointments, an adventure that seems destined to continue. "So far, most of it is still theory, but we succeeded in the first small step of demonstrating in the laboratory the physics of horizons for light. "We used ultra-short light pulses in micro structured optical fibres to demonstrate the formation of an artificial event horizon in optics." The researchers hope that by using sophisticated laser systems and advanced optical fibres, their horizon will eventually be strong enough to observe Hawking's radiation theory.